I remember reading this book in school those so many years ago and what happens in over a few decades? The book is transformed into a feature movie where an 11-year old boy must prove his worth in school by agreeing to eat 10 worms per day. Billy not only faces the challenges from the bully’s at school but also his blabbermouth brother and of course his stomach where he must endeavour to keep these worms down. This movie is definitely a must have family movie that is entertaining from start to finish that features some amazing acting from Luke Benward and newcomer Hallie Kate Einsenberg. 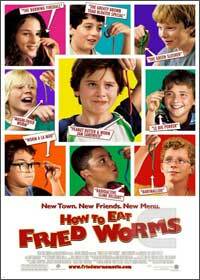 Presented in an aspect ratio of 16:9 with Dolby Digital 5.1, How to Eat Fried Worms is a first class presentation from the moment the DVD is played in your DVD player. The unfortunate aspect of this disc is that it does not come with any extras whatsoever but it’s definitely one title that will be watched over and over again. Entertaining!